First Listen: Cloud Cult, 'Love' The Twin Cities band's ninth album bursts with warmth, whether in spare examinations of faith or in big-hearted explosions of ecstatic celebration. At times, Cloud Cult's music recalls the larger-than-life reverie of The Polyphonic Spree, but the music on Love feels more personal and fragile. Cloud Cult's album, Love, comes out March 5. 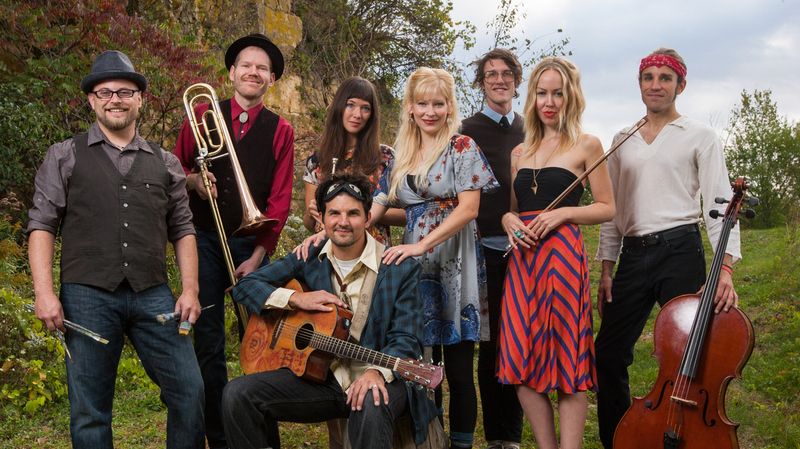 For the long-running Twin Cities band Cloud Cult, uplift is earned. The group's bighearted and life-affirming concerts feature a large ensemble, complete with strings, horns and two artists who create paintings for auction over the course of each night's set. Cloud Cult's recording, touring and manufacturing process is painstakingly engineered to leave the tiniest possible carbon footprint. And, most tellingly, singer and bandleader Craig Minowa sings about love, hope, community and beauty through the prism of a tragic past; in 2002, he and his wife lost their 2-year-old son unexpectedly, an event that led him to intensify the soul-searching in his music. For Cloud Cult, the ecstasy in its songs is forged in pain, and that journey helps give its albums real weight. Quite possibly the least ironic — and least cynical — band in existence, Cloud Cult will release its ninth album, Love, on March 5; characteristically, it's packed with optimistic theories about how we connect to each other and the world around us. Also true to form, the music that surrounds those messages bursts with warmth, whether in spare examinations of faith or in big-hearted explosions of ecstatic celebration. At times, Cloud Cult's music recalls the larger-than-life, sing-along reverie of The Polyphonic Spree; it's no coincidence that both bands grew out of personal tragedy. But in many ways, the music on Love feels more personal and fragile, as Minowa and his bandmates aim to construct music that radiates outward from a single, deeply held philosophy: that in order to make sense of the world, we must embrace it and its occupants with everything we have.